Why Ambassador College students NOW say... "We Wish We'd NEVER 'Gone Steady'!" Enoch was translated that he should not see death. Elijah went up by a whirlwind into heaven. Yet the Bible reveals they are not in heaven today! Where are they? Here's the astounding truth. ENOCH WAS "translated." Where did he go? Was he immediately taken to heaven? No! Because Jesus Himself said: No man hath ascended up to heaven, but he that came down from heaven, even the Son of man" (John 3:13). Here are Jesus' own words that no man, except Himself, had ascended into heaven! At the age of 65 Enoch had a son named Methuselah. "And Enoch walked with God after he begat Methuselah three hundred years, and he begat sons and daughters" (Gen. 5:22). No one can walk with God unless he is in agreement with the will of God and doing it. Amos the prophet said: "Can two walk together, except they be agreed?" (Amos 3:3.) So in his generation Enoch was the only recorded person who followed the ways of God — even though it took him sixty-five years to learn to walk with God! Because "all the days of Enoch were three hundred sixty and five years" (Gen. 5:23). All the days of Enoch were three hundred and sixty-five years. Not just part of his days, but all his days! If Enoch did not die — if he were changed to immortality — and thus continued to walk with God, then his days would have been more than three hundred and sixty-five years. But the Bible plainly says that all his days were just that many, and no more! This expression "all his days" is used in the same fifth chapter of Genesis about a dozen times and always it means that the person lived for that length of time only "and he died." So Enoch lived no more than three hundred and sixty-five years because "all the days of Enoch were three hundred and sixty-five years." As he lived only for this length of time then he must have died! That's what some people carelessly assume without proof. The original Greek word for "translate" is metatithemi. According to Arndt-Gingrich's Greek-English Lexi­con of the New Testament, 1969 edition, the primary meaning is to "convey to another place ... transfer" (p. 514). This same Greek word is rendered "carried over" in Acts 7:16. Here we read that after Jacob died his body was "carried over" — transported, translated — to Sychem where he was buried! That's what your Bible says! Jacob was transported or translated to the place of burial! That is why Moses said that God took Enoch. God removed — translated — him so that he was not found. God took Enoch and buried him! In Deuteronomy 34:6 we read also how God took Moses from the people after which he died and was buried by God. "But no man knoweth his sepulchre unto this day." God removed Moses- God translated him — and he was not found either! Notice another proof that "translate" does not mean to make immortal. It is found in Colossians 1:13: the Father "hath delivered us from the power of darkness, and hath translated us into the kingdom of his dear Son." Here the Bible says that Christians are already translated — but Christians still die! We are not immortal bodies, but mortal flesh and blood. Although we were once part of the darkness of this world, now we are translated, removed from darkness into the light of the Kingdom of God. Enoch is included by Paul (in Hebrews 11) among the fathers who obtained a good report through faith; but "these all, having obtained a good report through faith, received not the promise" (Heb. 11:39). What promise? The "hope of eternal life, which God, that cannot lie, promised before the world began" (Titus 1:2). Since Enoch has not yet inherited eternal life he must be dead! This is exactly what Paul writes in Hebrews 11:13. Paul says Enoch died! Notice it. "These all died in faith, not having received the promises." Who were these "all"? Paul tells us: Abel, Enoch, Noah, and the patriarchs and their wives. Hebrews 11:1-12lists those who had faith and Enoch is included among them. Then in verse 13 Paul proved that they had not inherited the promises by saying: "These all [including Enoch] died in faith." Enoch lived only three hundred sixty-five years. Then what could Paul possibly have meant by saying: "By faith Enoch was translated that he should not see death; and was not found because God had translated him"? This verse nowhere says that Enoch did not die. Rather, it says that Enoch "should not see death." But what does it mean? But Paul was not writing about that death. The phrase "should not see" is in the conditional tense of the verb, having reference to a future event. It is not in the past tense, that he "did not see" death — but that he "should not see death." So this death that Enoch escaped by being translated is one that he can escape in the future on certain conditions! Did Jesus ever speak of a death that might be escaped? He certainly did! In John 8:51 Jesus said, "Verily, verily, I say unto you, If a man keep my saying, he shall never see death"-shall never see- that is, suffer- the second death! And again in John 11:26, "Whosoever liveth and believeth in me shall never die" — or "shall not die forever." This death is one that can be escaped on condition that men keep the saying of Jesus and believe Him. This death is not the first death, because Christians who keep Jesus' sayings die this first death. Then the death which Enoch should escape must be the second death which will never touch those who are in the first resurrection (Rev. 20:6). And Enoch will be in the first resurrection because he met the conditions! Now we can understand Hebrews 11:5: "By faith Enoch was translated that he should not see death; and was not found, because God had translated him: for before his translation he had this testimony, that he pleased God." Examining this verse fact by fact, we notice that Enoch had faith and was translated. This translation removal, transferee — was on condition of faith. Now what translation mentioned in the Bible is on condition of faith? Why, the one we read about in Colossians 1:13. The Father "hath delivered us from the power of darkness, and hath translated us into the kingdom of his dear Son." This is a figurative translation- a figurative removal or transference from the spiritual darkness of this world to the light of the family or Kingdom of God and Christ. In verse 10 Paul shows that to abide in this Kingdom we must "walk worthy of the Lord unto all pleasing." This is exactly what Enoch did. He walked with God, and pleased God. By faith Enoch was separated — removed or translated — from the world, the same as Christians who are not to be a part of the world, although living in the world. Not only was Enoch figuratively taken from the society of his day, but he was also literally removed — translated — so that he was not found. God took him physically away from the people, just as He later took Moses. And God buried each so well that neither has ever been found since! We have already read that "all the days of Enoch were three hundred sixty and five years" (Gen. 5:23). Now look at the entire fifth chapter of Genesis. The shortest lifespan described, aside from Enoch's, is the seven hundred and seventy-seven years lifetime of Lamech. The longest is Methuselah's nine hundred and sixty-nine. But Enoch lived only three hundred and sixty-five. Why? Clearly Enoch died a premature death! He did not complete his normal life cycle. He was cut off, as it were, in the midst of his days. But what happened? Does the Bible give us any clue? Lamech, a descendant of Cain (not the same person listed in the genealogy of Genesis 5), boasted to his two wives: "I have slain a man to my wounding, and a young man to my hurt. If Cain be avenged sevenfold, truly Lamech seventy and sevenfold" (Gen. 4:23-24). The "man" was Cain. Hence Lamech's reference to the fact that God would take vengeance on anyone who dared to murder Cain. But who was the "young man"? Enoch at age three hundred and sixty-five would certainly be considered a young man by his generation. Enoch walked with God. Furthermore, he prophesied of the coming of Christ to execute judgment and to convict the ungodly (Jude 14-15). He was in effect a "preacher of righteousness" (compare II Peter 2:5). But God's message has never been popular. As a servant of God, Enoch undoubtedly convicted and enraged many by his message. His life was in danger. Finally that ungodly generation tolerated Enoch's preaching no longer. By comparing Lamech's saying with the age of Enoch at his death, we may deduce from Scripture that Lamech (by himself or with a mob) stilled Enoch's voice by murder. Don't think this strange or unusual. Hebrew tradition reveals that Noah, the great grandson of Enoch, had to flee for his life in order to carry out the Work of God. "But Noah was very uneasy at what they [the pre­ Flood world] did; and being displeased at their conduct, persuaded [urged] them to change their dispositions and their acts for the better: but seeing they did not yield to him, but were slaves to their wicked pleasures, he was afraid they would kill him, together with his wife and children, and those they had married; so he departed out of the land" (Josephus, Antiquities of the Jews, book I, chapter 3, section 1, Whiston translation). God allowed Enoch to be martyred. But He would not permit his body to be desecrated or publicly displayed. God physically removed his body, very likely in the sight of his murderers — before they could defile it. Otherwise how would anyone have known that God had taken him? God gave this sign of physical removal as a type for all those who should later follow Enoch's example of faith. He was taken physically from the people just as Christians are to be spiritually removed from the ways of this world. The physical translation or carrying away of Enoch was also a sign from God that his faith had been accepted — God often gives signs (Isaiah 38:7). 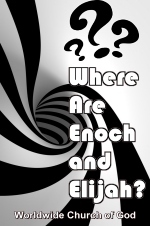 The question may arise, why did God allow His righteous servant Enoch to die? The Bible contains — if you have eyes to see — a chronicle or obituary of the death of the prophets and apostles of God throughout history. Many of the greatest men of the Bible were martyred. God is concerned with one's physical welfare. But He is more concerned with one's spiritual state and one's eternal life. Enoch had to be willing to die for the truth he preached. Like every true saint, Enoch is awaiting the hope of the resurrection and the return of Jesus Christ, the Messiah (Jude 14, 15). You HAVE been told that Elijah went to heaven. Yet over 900 years after Elijah was taken up by a whirlwind Jesus Himself said: "No man hath ascended up to heaven, but he that came down from heaven, even the Son of man" (John 3:13). Is this a Bible contradiction? Did Elijah really ascend to the heaven where God's throne is — even though Jesus said he didn't? Notice why! Hebrews 8:1-5 explains that the original earthly tabernacle under the Old Covenant, with its most holy place, or compartment, was the type of the throne of God in heaven. Only the high priest — type of Christ as High Priest now — was allowed to enter! The second heaven represents the expanse of this great universe — the space where we find the sun, moon, stars, comets and planets. How often do we find the Psalmist admiring the "heavens, the work of thy fingers, the moon, and the stars, which thou hast ordained"! (Psalm 8:3; see also Genesis 1:15-17). Beside the heaven of the stars, we find that the atmosphere, the air that surrounds this world, is also called heaven. Birds fly "in the midst of heaven"- certainly not God's throne in heaven — for we read in Genesis 1:20 of "fowl that may fly above the earth in the open firmament of heaven." In blessing Jacob, Isaac said, "God give thee of the dew of heaven," and Moses joyed that the "heavens shall drop down dew" (see Gen. 27:28 and Deut. 33:28). This first heaven, from which dew comes, means the atmosphere, where the clouds and the wind roam. Every­ one of us is right now breathing the air of heaven! Since Elijah could not have gone to the heaven of God's throne, then to which heaven did he go? — for the scripture reads: "... And Elijah went up by a whirlwind into heaven" (II Kings 2:1, 11). The answer ought already to be quite obvious! Elijah "went up by a whirlwind into heaven" — not to the heaven of God's throne, but into this earth's atmosphere, the first heaven. There could be no whirlwind in any other place but in the atmosphere surrounding this earth — in the first heaven, in which the birds fly. You certainly have seen the great lifting power of a whirlwind, haven't you? What was the reason for this unusual act of God? Why did He take Elijah up into the atmosphere? Was it to make him immortal? No! The Scripture says no word about that! The ancient prophets — including Elijah — did not receive any promise of immortality prior to or apart from us. Notice it in Hebrews 11:32 and 39: "These all, having obtained a good report through faith, received not the promise"! And we shall not receive it until Christ returns (Heb. 11:40). So Elijah was not to be made immortal — for that would give him pre-eminence above Jesus. But what does the Bible reveal as the reason for his removal? II Kings 2:3 ..and 5 has the answer. Notice now what the sons of the prophets said to Elisha: "Knowest thou that the Lord will take away thy master from thy head today?" Or as the Smith and Good­ speed translation has it, "Do you know that today the Lord is about to take away your master from being your leader?" Christ is the head of the Church today as Elijah was the head or leader of the sons or disciples of the prophets in that day. God had sent Elijah as His prophet to wicked king Ahab and to his son Ahaziah. Now God wanted Elisha to direct His work, as Ahaziah the king had died (II Kings 1:17-18) and a new king was ruling. He could not allow Elijah to be among the people with Elisha directing the work now. That would have been the same as disqualifying him! Since God never takes an office from a man when that man has been performing his duty well, the only thing God could do would be to remove Elijah so that another could fulfill the office. This God did. When he was taken up Elijah's mantle dropped from him and Elisha picked it up. See II Kings 2:12-15. In Clarke's Commentary we note that it was "worn by prophets and priests as the simple insignia of their office" (vol. 2, page 484). The purpose of God in removing Elijah was to replace him with another man who would occupy Elijah's office in Israel for another generation. This work had to start under a new king, for Ahaziah had just died. And Elijah was already aging. So as not to disqualify Elijah in the sight of the people, God took him away from the sons of the prophets and the people, allowing the mantle which signified the office of Elijah to drop into the hands of Elisha. Thus God preserved the name and office of His prophet. Having crossed Jordan near Jericho, Elijah was take up by a whirlwind in what appeared to be a chariot and horses of fire. The violent motion of the wind pulled the mantle off the prophet as he was seen to ascend into the sky. You probably remember reading the promise of Elijah that Elisha would have a double portion of the Spirit of God if he would be allowed by God to see Elijah taken up (II Kings 2:9). All this meant that Elisha was to be the leader, the new head of the sons of the prophets. The sons of the prophets who knew that their master was to be removed also knew that Elijah was not to die then. That is why they were fearful that the Spirit of God might have allowed him to drop "upon some mountain, or into some valley" (II Kings 2:16). Elisha knew that God would preserve Elijah from falling, but at their insistence he permitted men to go in search for him — to no avail. Immediately before Elijah disappeared into the distance a new king had come to the throne in Israel (com­ pare II Kings 1:17 with 3:1). The new king's name was Jehoram, or Joram as this name is sometimes spelled. He was another son of Ahab. The first year of Jehoram's reign was 893-892 B.C. During Jehoram's reign Elisha was the recognized prophet of God (II Kings 3:11). Meanwhile, in Judah, the son of Jehoshaphat began to reign as co-regent along with his father (II Kings 8:16). This king, who began to reign in the fifth year of Jehoram, king of Israel (889- 888 B.C. ), was also named Jehoram. He had been associated with his father on the throne for five previous years (894-889 B.C.) but without the full authority of a co­ regent (II Kings 1:17). Jehoram, of Judah, reigned as co-regent four years (889-885 B.C.) with his father Jehoshaphat (II Kings 8:16). Jehoshaphat died in the year 885 B.C. This was about the eighth year since Elijah had disappeared (remember, he had disappeared almost immediately after Jehoram of Israel took the throne in 893 B.C.). When Jehoshaphat was dead, his son Jehoram, now'sole king of Judah, slew his brothers and some of the princes to further secure the throne (II Chron. 21:1-4). The year after the death of Jehoshaphat, Edom revolted from Judah's king Jehoram (II Kings• 8:20-24 and II Chron. 21:8-10). After that brief war, Jehoram of Judah set about to build high places and introduce pagan customs (II Chron. 21:11). He followed the ways of the nations about him and did evil in God's sight. About ten years had now expired since Elijah was taken from the people. But what do you think was about to happen? The contents of the letter are found in II Chronicles 21:12-15. In part it reads: "Because thou hast not walked in the ways of ... thy father... but hast walked in the way of the kings of Israel... and also hast slain thy brethren of thy father's house, which were better than thyself... thou shalt have great sickness by disease." From the wording of the letter, it is clear that Elijah wrote it after these events had occurred, for he speaks of them as past events, and of the disease as future. Two years after the king became diseased, the king died — having reigned only eight short years (II Chron. 21:18-20). God used Elijah to convey the message because he was the prophet of God in the days of the present king's father — and the son was not going in the ways of his obedient father, Jehoshaphat. The letter he had others deliver was recognized as his-proving that he was known to be alive someplace. Just how much longer he lived, the Bible does not reveal. But in that "it is appointed unto men once to die" — Elijah must have died somewhat later. See Hebrews 9:27. All human beings born of Adam, and that includes Elijah, must die — for we read: "In Adam all die" (I Cor. 15:22). Elijah was a man "subject to like passions as we are" (James 5:17) — subject to human nature and death! Eli­ jah the prophet, being mortal flesh as we are, died. He is certainly one of the "prophets" (Heb. 11:32) who died in faith not yet having received the promise (verses 13 and 39). To suppose that God gave him the power of an endless life of nearly three thousand years already is to read into the Bible what is not there! He was mortal, subject to death, and after being lifted into the atmospheric heavens, spent the remaining years of his life at some unidentified location on the earth, living as every human being, before he naturally died. Now what about the appearance of Moses and Elijah on the Mount of Transfiguration with Jesus? The record of the event is found in Matthew 17:1-9; Mark 9:2-10; Luke 9:28-36. Leaving the mountain, Jesus told his disciples: "Tell the vision to no man" (Matt. 17:9). A vision is not a material reality but a supernatural picture observed by the eyes. Moses died, and was buried (Deut. 34:5-6). Both he and Elijah were still dead in their graves, but in vision both they and Jesus were seen in the glory of the resurrection — an event to which Moses and Elijah have not yet attained (Heb. 11:39). The vision was granted the disciples after Jesus had spoken of the glory of immortality in the coming Kingdom. Jesus spoke about this prophecy in Matthew 17. He showed that the work of John the Baptist was a preliminary fulfillment of Malachi's prophecy: "And his disciples asked him, saying, Why then say the scribes that Elias [Elijah] must first come? And Jesus answered and said unto them, Elias truly shall first come, and restore all things. But I say unto you, that Elias is come already, and they knew him not, but have done unto him whatsoever they listed [whatever suited them]. Likewise shall also the Son of man suffer of them. Then the disciples understood that he spoke unto them of John the Baptist" (verses 10 13). Luke said John was "in the spirit and power of Elijah," NOT that he WAS literally Elijah. That Elijah had died centuries before. But. John the Baptist was empowered by the same spirit which had guided the Elijah of old to point Israel's eyes to the true God, and for much the same purpose. An Elijah is yet to come, however, said Christ — after John was already dead. So just as John the Baptist was the forerunner of Jesus Christ at his first coming, another is to come before the great and terrible Day of the Lord, as a forerunner of Jesus Christ at his second coming. He, like John, will come in the spirit and power of Elijah to fulfill the commission of Malachi 4:5, 6 "lest I come," says God, "and smite the earth with a curse." The world of Christ's day did not recognize John as coming in the power and spirit of Elijah. And neither will the world today recognize the one whom God sends in the spirit and power of Elijah shortly before the terrible Day of the Lord, when the Jesus Christ of your New Testament will intervene in world affairs to set up the government­ Kingdom — of God on earth. If heaven be the reward of the saved, where the righteous go immediately at death, we should certainly expect David, of all people, to be in heaven. God called David, king of Israel, "a man after mine own heart" (Acts 13:22). Further, in Acts 7:46 we are told that David "found favour before God." Yet the Apostle Peter, in the first sermon of the New Testament Church, was inspired to say: "Men and brethren, let me freely speak unto you of the patriarch David, that he is both dead and buried, and his sepulchre is with us unto this day" (Acts 2:29). Peter then added: "For David is NOT ascended into the heavens" (verse 34). Plainly, David is dead and buried, in his grave, and not in heaven! God's Word says so! In Hebrews 11:32, David is included among those who died in faith. Now turn to verse 39 of this same chapter: "And these all [and that includes David], having obtained a good report through faith, received not the promise: God having provided some better thing for us, that they [including David and all the worthies of old] with­ out us should not be made perfect. " David's resurrection is spoken of in Jeremiah 30:9: "But they [Israel] shall serve the Lord their God, and David their king, whom I will RAISE UP. " Notice the time setting of this event is yet future. Ezekiel adds, "... And my servant David shall be their prince forever" (Ezek. 37:35). This is the time — still to occur — when David will receive eternal inheritance in God's Kingdom. Furthermore, David could not possibly be in heaven. Jesus said, over 1000 years after David had died, "No man hath ascended up to heaven... " (John 3:13). Jesus had been in heaven. He knew! David himself knew and described what hap­ pens to man at death. He wrote: "His breath goeth forth, he returneth to his earth; in that very day his thoughts perish " (Psalm 146:4). There is no knowledge or consciousness in the grave (Ecclesiastes 9:5, 6, 10). The dead, Scripture says, await a resurrection (I Thess. 4:15-17; I Cor. 15:50-52; Dan. 12:2). How plain! David is dead and buried, awaiting the resurrection with all of God's saints. At that time he will receive the promises. To find out what these promises are (you'll be surprised to find they do not include heaven at all! ), be sure to read our free booklet What Is The Reward Of The Saved?